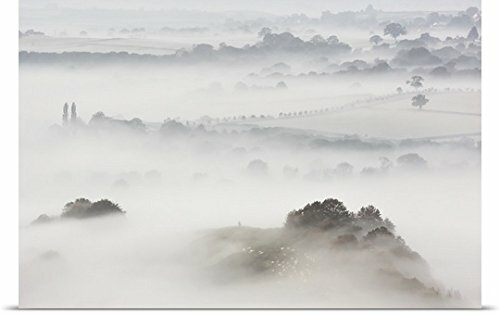 Poster Print entitled 'Wearyall Hill from Glastonbury Tor, Somerset, UK'. Wearyall Hill, the location of the famous Holy Thorn tree, surrounded by mist just before sunrise on a cold winters morning. Multiple sizes available. Primary colors within this image include: Black, Gray, Silver. Made in USA. Satisfaction guaranteed. Inks used are latex-based and designed to last. Printed on high quality gloss finish paper with archival quality inks. Looks great in dorm rooms, kid rooms, offices, and more.